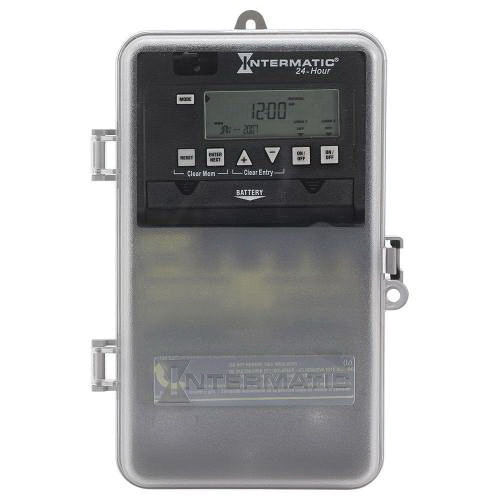 Intermatic ET1100 Series Electronic timer switch in gray color, has polycarbonate plastic construction for high-impact resistance and durability. This 2-circuit switch with SPST contact, has a current rating of 30-Amps and voltage rating of 120/208/240/277-Volts AC at 50/60-Hz. The 1-Pole switch features automatic daylight saving time adjustment. This timer switch with to-the-minute accuracy, astronomic models that enable dusk-to-dawn scheduling. It is suitable for interior lighting, exterior lighting, electric pumps, electric motor control and various other electrical loads. The electronic timer switch meets cULus and Title CA 20 standards.